Foreign ministers from four Latin American nations condemn violent clampdown on protesters by President Daniel Ortega's government. Amid escalating violence and repression against dozen of anti-government protesters in Nicaragua, Argentina and members of Mercosur have condemned Daniel Ortega's government for human rights abuses, via a statement released by the bloc's foreign ministers Monday. The South American countries expressed “repudiation of the Nicaraguan government's repressive actions against opponents and concern for the arrest of human rights defenders occurred on Sunday, October 14, which exacerbates the social and political crisis the country is going through." The foreign ministers of Argentina, Brazil, Paraguay and Uruguay met Monday in Montevideo, Uruguay, to “reiterate their rejection of the ongoing restriction on individual freedom suffered by the Nicaraguan people and the rising violence caused by police repression, which is considered incompatible with democracy and have caused a high number of victims since last April." Protests in Nicaragua began on April 18 over recent social security reforms, leaving several people injured and more than 300 dead. On Sunday, Nicaraguan police wielded clubs and hurled stun grenades at a group of demonstrators gathering for an anti-government protest in a shopping centre car park in the capital, Managua. Among detainees are several leaders of civil society organisations (CSOs) and the Sandinista Renovation Movement (MRS). "Do not shoot" and "freedom" were some of the slogans shouted to the police agents violently repressing protestors. Men and women, some of them elderly, were beaten by police before being dragged down the street and loaded into police vehicles. 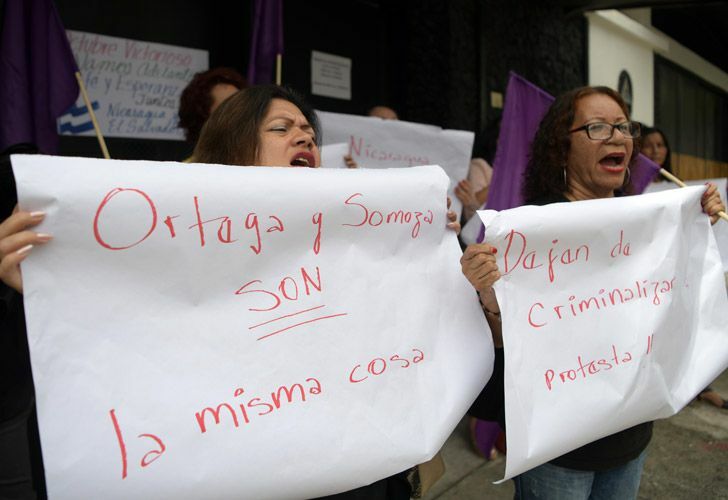 The demonstrations were part of an alliance of 40 opposition groups calling for President Ortega and his wife and vice-president, Rosario Murillo, to step down.